Speaking for the first time on the appointment of the Indian team coach, legendary batsman Sachin Tendulkar said that the experience of Anil Kumble both as a skipper and the spearhead of the spin department, will help to nurture the young talent of team India. 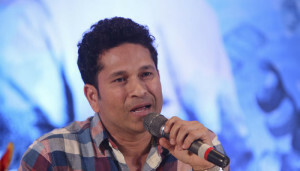 Tendulkar also echoed Ganguly on the transparent procedure followed in selection of the head coach. “I will not talk much about controversies. Anil Kumble, he is a great bowler and a legend. He had played cricket close to 20 years and has plenty of experience to share. The former skipper is ready to share everything he has learnt playing this sport and i hope that the players, especially the spin department would benefit from his experience”, Tendulkar said. “Winning games is all about standing firm in those tough moments with a hard character. This is where Anil will be at his best, he will be there with the team to win those crunch moments”, he added. The 43-year old said that his experience with Anil Kumble as teammate has always been fantastic, While terming him as a match-winner. “He is a true match winner. He had won several matches for India at difficult times. I personally love his discipline and i believe that the same will be passed on to the younger generation under Rahul Dravid and Anil Kumble”. Tendulkar also supported the recent comments made by Australian player David Warner over increasing flat pitches in international Cricket. “Yes, that is an untold truth. Flat pitches will make the game boring. There should be a balance between bowling and batting. Competitiveness between this two factors is what makes the game interesting to the spectators. I feel that the ICC should consider proposals to make this game more bowler friendly”. Earlier, David Warner commented that flat pitches in cricket will do more harm than the increasing size of bats. Reliance Jio to hit the commercial markets on August 15 ? !